ProduKey is an excellent free key finder program. ProduKey is uncomplicated and instantly displays serial numbers and product keys. If you're getting ready to reinstall Windows (or nearly any other program) but can't locate the product key or serial number required to install it, ProduKey can help. It will automatically display the product keys and serial numbers for many different Microsoft based applications. This review is of ProduKey v1.93. Please let me know if there's a newer version I need to review. 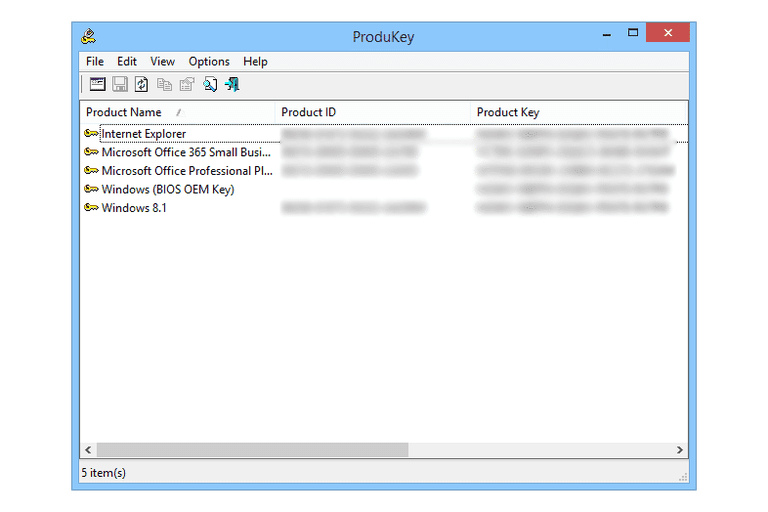 ProduKey is an excellent free key finder as long as you're only after a Microsoft product key. Product keys are displayed right away when the program is launched. The thing I like most about ProduKey is how easy it is to load product keys from external Windows installations or from other computers on your network. This feature makes ProduKey valuable as a way to extract the Windows product key from a damaged computer where booting into Windows is impossible. My biggest concern with ProduKey is that the product ID, not the product key, is displayed first in the results window. There's little use for the product ID—it's the product key that's necessary when installing the program. This might be confusing if you don't know the difference. NirSoft seems to regularly update ProduKey which I see as a good sign that it will be around for a while. I have no qualms about recommending ProduKey to anyone needing to find a Microsoft product key, especially if that key is located on a networked or crashed PC. Didn't find what you were looking for with ProduKey? Try another free key finder program or maybe even a premium key finder tool. Another product key finder program might be able to find the serial number or product key for the specific application you're after.